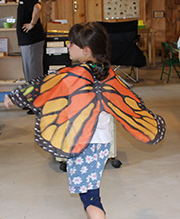 This little girl enjoys being a Monarch butterfly at the Nature Discovery Center in Warner. WARNER, NH –– October 15, 2018––As part of its Community Outreach Program, the Nature Discovery Center of Warner recently hosted children and their mentors from the Concord-based Friends Program. Friends pairs children in need of adult mentors with volunteers who serve as positive role models. The Nature Discovery Center teaches children and adults about the many wonders of nature and how they can help preserve it. The Nature Discovery Center offers a wide variety of displays from mounted wildlife and insects to plant life, sea life, fossils, rocks and minerals. Its outdoor pollinator garden and nature trail are well visited. The Nature Discovery Center will be closing for the winter at the end of October and will reopen in late May. 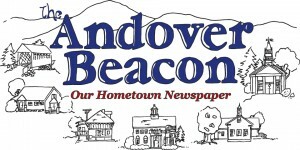 During the winter and early spring, the Center offers free indoor nature programs at either the Hopkinton Town Library or the Pillsbury Free Library in Warner. These programs will be listed soon on its website: ndcnh.org and on its Facebook page.